I never thought I’d see the day that we’d buy a minivan — BUT WE DID!!! This weekend, we went up to CarMax on the northside to test drive a minivan we’ve been researching. When we saw it and checked it out, we quickly realized it’s the perfect minivan for us! It’s a silver 2011 Dodge Grand Caravan and has some great features: deep “well-like” trunk space, spacious interior and bucket seats, DVD player (as the girls get older, that will certainly come in handy), automati c open and close side and rear doors, and a touch screen navigation system. We love it! We even brought along “props” to test the van out. We brought Hannah’s car seat, as well as a newborn car seat to see how well they fit and to see if they’d allow for much leftover space. We brought the big stroller, too, to see how well it fit in the trunk. Short of purchasing a big custom van like my parents have, this is the best option for hauling all of our stuff! Unfortunately, we had to trade in my beautiful 2010 Mazda 3 in order to get it. I’m not gonna lie — it was a tearful goodbye for me. I got a little misty cleaning it out and transferring items over to the new van. I only had the Mazda for a year, but it reminded me about getting my first nice car after driving around a junk bucket all through college and how good it’s felt zipping around downtown in it with my favorite feature — bluetooth. But we traded it in 1) because Greg’s car is already paid off, so it wouldn’t make sense to trade in a car we own just to start making double payments again, and 2) because the Mazda is more of a sport sedan and isn’t really even big enough to carry the three of us right now. So, it just doesn’t match our lifestyle. 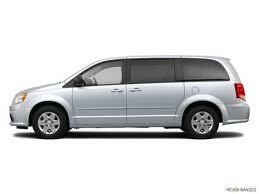 Going forward, Greg will be driving the minivan though. I’ll be driving his Saturn since it’s easier to maneuver downtown and it gets better gas mileage for my long commute. I must say, driving the van home on Saturday, it seemed to “suit” us well. Greg seemed like a natural in the driver’s seat and I could picture the day when I’d turn around and see all four of my little ducklings fast asleep on a long drive home. Here’s to many years and a ton of memories in our new family car! What a funny parody!? You have definitely crossed over the line to all of the soccer moms – it is a beautiful ride! Funny. Not much has changed. It was this way when you were a baby as well. We went through five minivans until we graduated up to Bertha :-). The mom in the video is the one from the Progressive commercial that says “it’s a european shoulder bag”. 🙂 I like your van. That definitely changed for the better.